Immersing yourself in nature without leaving the comfort of your room may sound too good to be true, but that’s exactly what French architect and civil engineer Christophe Benichou set out to achieve with the LUMISHELL. 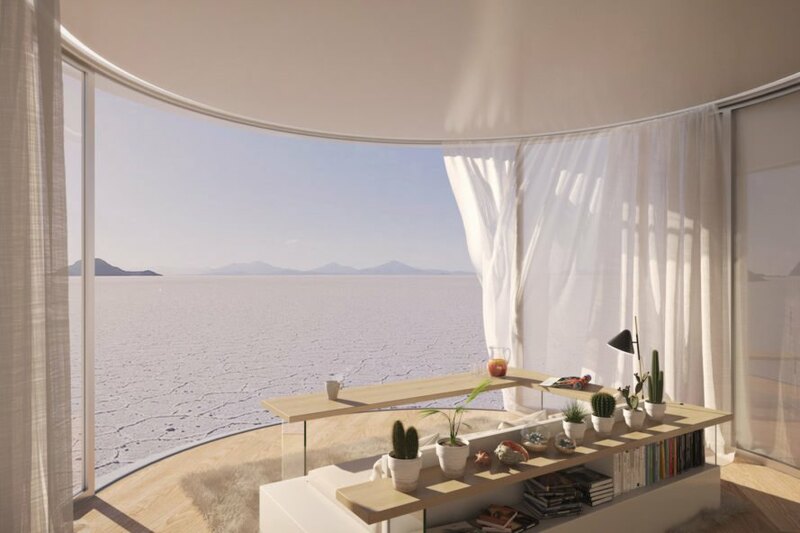 Created in the shape of a cocoon, this prefabricated curved dwelling blurs the distinction between indoor and outdoor space with LUMICENEs, a patented reversible window concept. 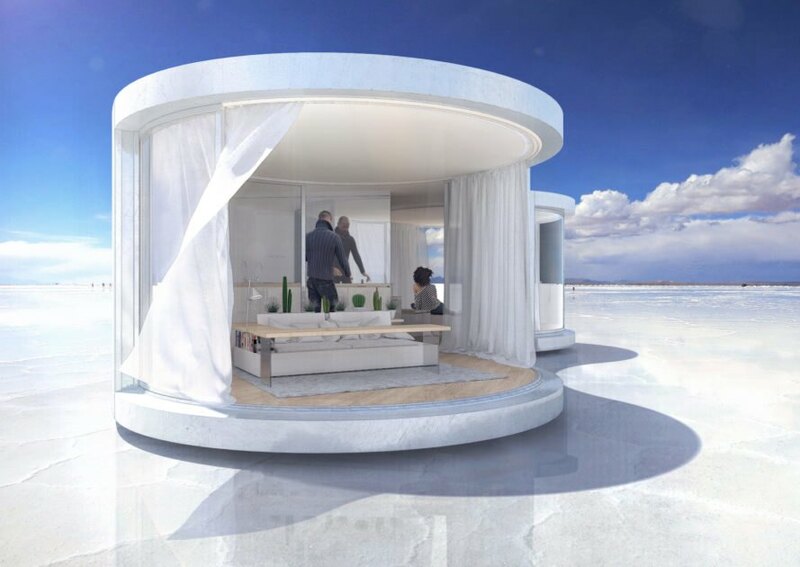 The LUMISHELL is designed for placement in a variety of exotic environments—even in Salar de Uyuni, the world’s largest salt flat that experiences below freezing temperatures. 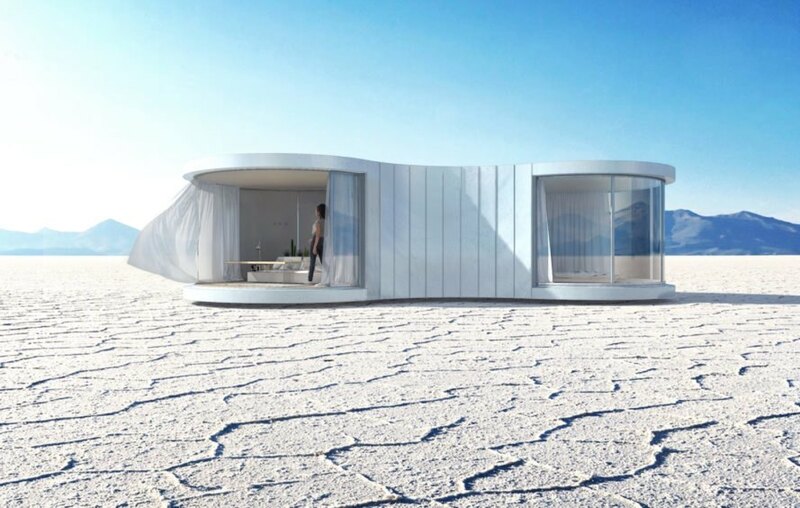 Clad in a protective aluminum skin, the 40-square-meter LUMISHELL comprises all the needs for a comfortable, long-term stay including a bedroom, bathroom, kitchen, and living room. The bedroom and living room are located at opposite ends of the curved dwelling and wrapped by LUMICENE, a curved glass sliding door that opens up to transform the room into an outdoor space. Curtains attached to the LUMICENE rails allow for privacy and protection from solar gain, while the shape of the structure is optimized for natural cross ventilation. 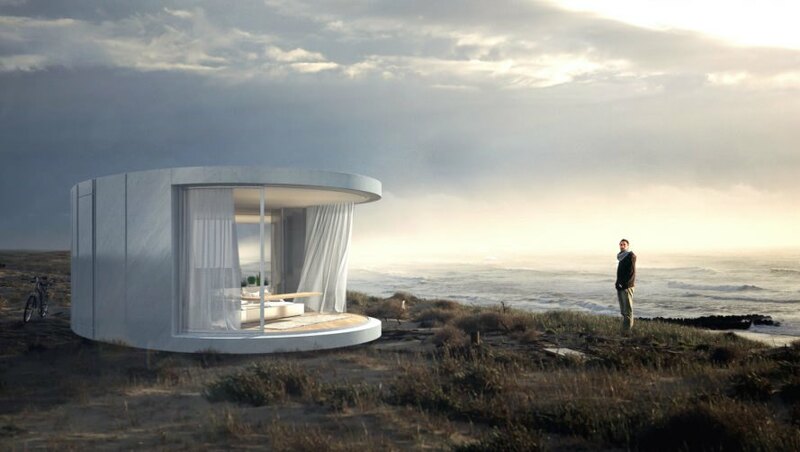 Related: Cover installs its first prefab dwelling “for the masses” in L.A.
“Both rooms provide unique panoramic views and can be occasionally transformed into outdoor spaces to enhance the feeling of being transplanted in the middle of vast scapes,” wrote the architect. “Various mirrors also create reflections that diffuse the landscape in the heart of the dwelling.” The self-supporting and prefabricated LUMISHELL can be assembled on site in as little as four days—not including hookups—and does not require foundations. The LUMISHELL is currently available for pre-orders and is expected to ship out for first installations in 2018. Immersing yourself in nature without leaving the comfort of the hotel room may sound too good to be true, but that’s exactly what French architect and civil engineer Christophe Benichou sets out to achieve in LUMISHELL. Created in the shape of a cocoon, this prefabricated curved dwelling blurs the distinction between indoor and outdoor space with LUMICENEs, a patented reversible window concept. 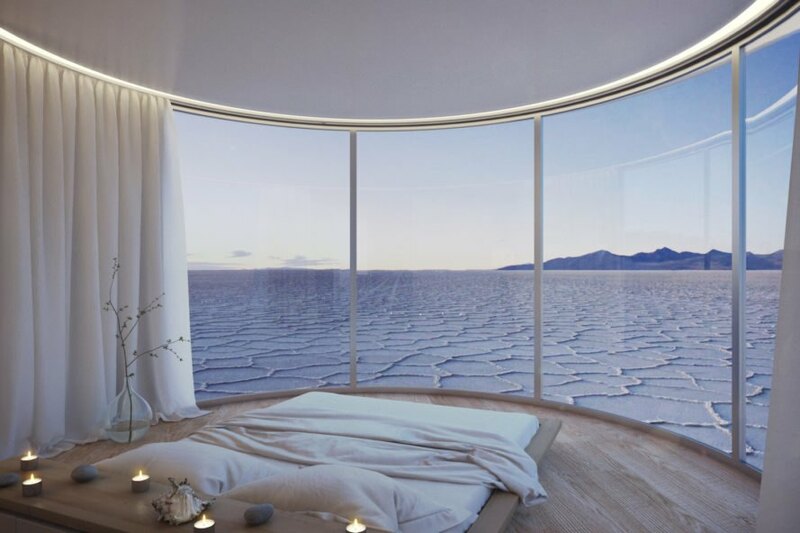 The LUMISHELL is designed for placement in a variety of exotic environments—even in Salar de Uyuni, the world’s largest salt flat that experiences below freezing temperatures. 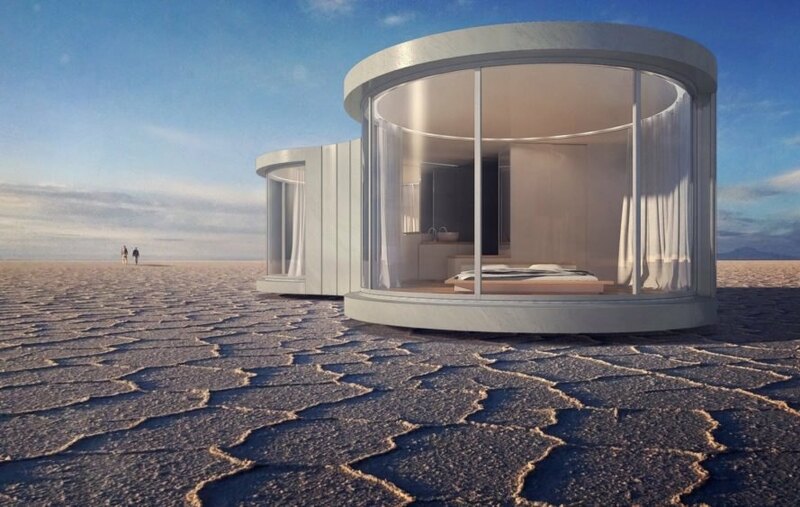 Clad in a protective aluminum skin, the 40-square-meter LUMISHELL comprises all the needs for a comfortable, long-term stay including a bedroom, bathroom, kitchen, and living room. The bedroom and living room are located at opposite ends of the curved dwelling and wrapped by LUMICENE, a curved glass sliding door that opens up to transform the room into an outdoor space. Curtains attached to the LUMICENE rails allow for privacy and protection from solar gain, while the shape of the structure is optimized for natural cross ventilation. The self-supporting LUMISHELL can be assembled on site in as little as four days—not including hookups—and does not require foundations. The LUMISHELL is currently available for pre-orders and is expected to ship out for first installations in 2018.